Did you know that as REALTORS® we do so much more than just sell homes? When I became an agent two and a half years ago, I knew I wanted to be involved in the many things that were going on, so I joined the Community Awareness Committee for the REALTORS® Association of Lincoln. Our committee dedicated 2018 to be the Volunteer Action Community Awareness Year or VACAY. We chose a different organization in Lincoln to promote, volunteer at, and support for each month in 2018. From the City Mission and our extremely successful sock drive, to ringing bells for the Salvation Army, the REALTORS® in Lincoln stepped up to the plate to do good for the community. We made such an impact we decided to continue with the VACAY for 2019! REALTORS® deliver for Meals on Wheels every week. We gathered over 16,000 pairs of socks in February for the People City Mission. 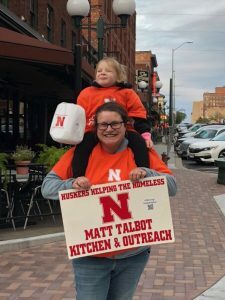 We take part in Stuff the Bus for the Friendship Home and Huskers Helping the Homeless for Matt Talbot. At Nebraska Home Sales, we have 44 agents that serve the Lincoln community. We are not the biggest office, but (in my opinion) we have the biggest hearts. Our office took on one month to deliver meals on wheels. We donated the 3rd highest number of socks per office for the 2019 sock drive. We have agents that work with low-income, first time homebuyers through the NeighborWorks program. We even have agents that have helped raise funds for multiple dog runs throughout the city. So the next time you picture a REALTOR® sitting on a pile of money, keep in mind that we care about you and will continue to do what we can to keep Lincoln the wonderful, friendly, helpful, BEST CITY TO LIVE IN for years to come. We care about our community as much as we care about our sellers and buyers. If you want to follow us online, you can check out #REALTORSVACAY & #LINCOLNREALTORSCARE on Instagram or follow the Nebraska Home Sales blog on our website www.nebhomesales.com.